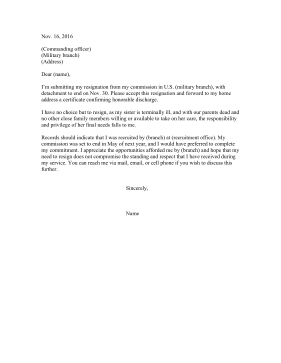 This printable resignation letter is for those in military service who need to request an honorable discharge for personal reasons. I'm submitting my resignation from my commission in U.S. (military branch), with detachment to end on Nov. 30. Please accept this resignation and forward to my home address a certificate confirming honorable discharge. I have no choice but to resign, as my sister is terminally ill, and with our parents dead and no other close family members willing or available to take on her care, the responsibility and privilege of her final needs falls to me. Records should indicate that I was recruited by (branch) at (recruitment office). My commission was set to end in May of next year, and I would have preferred to complete my commitment. I appreciate the opportunities afforded me by (branch) and hope that my need to resign does not compromise the standing and respect that I have received during my service. You can reach me via mail, email, or cell phone if you wish to discuss this further.